Translation of the byline: The Council of Swiss Citizens Abroad is preparing a resolution to denounce certain Swiss banking practices. The text, which shall be submitted this Saturday to a vote of the Council’s 140 delegates, asks that Swiss Citizens domiciled outside of Switzerland (approximately 700,000 people) are treated in the same way as other Swiss persons by Swiss bank establishements. The Q&A goes on to discuss Swiss banks who have refused to open accounts for, or closed the accounts of, persons living in the US, and mentions that there is cross-contamination of the problem to Swiss living in non-US jurisdictions. Lately, I keep hearing people say that ignorance of the law is no excuse and it does not constitute “reasonable cause” in the eyes of the IRS. Both notions are false with regard to the Foreign Bank Account Report (FBAR). Busy night here at Isaac Brock Society but we have a response up from Government/CRA on their position on FBAR. Somewhat legalistic language and a lot of information we already know but I want everyone to take a look at it. Key points: IRS ADMITS FBAR is NOT a tax and IS UNCOLLECTABLE in Canada and CRA has NO obligation under the tax treaty to help the US enforce it against anyone on Canadian territory. S. 1813, the highway (robbery) bill with amendments that let the Treasury Department ban credit cards from non-FATCA banks and give the IRS the power to take away expats’ passports, passed the Senate by a vote of 74-22 with 4 abstentions. The bill will now go to the House, where it will face off against H.R. 7, a competing surface transport bill by Rep. John Mica (R-FL). Secretary: Hello John Culberson’s office. American abroad: Hello, I am a voter in John Culberson’s district. What is the Congressman’s position on FATCA, FBAR, and Americans abroad? Secretary: I am not sure. Let me see if Robert is free. He is the legislative director. Generally, non-residents are either not entitled or not in a practical position to enjoy the same public benefits as residents. Why then should they bear similar — or more onerous — income tax burdens as residents (all the while focusing the question on domestic sources), putting aside source-country opportunism? I found this Financial Times article about the Swiss parliamentary vote, you will have to register for free at Financial Times to retreive it (8 articles per day for free or something like that [Editor’s Note: Try this link instead, routed through Google news]). Financial Times : Swiss parliament backs tax amendment The article seems to twist the whole affair around and as far as I am concerned it is negative press for us. Swiss Parliament, a Den of Traitors! Today is 6 March 2012, the morning after a very tragic day for Switzerland, and democracy all over the world. 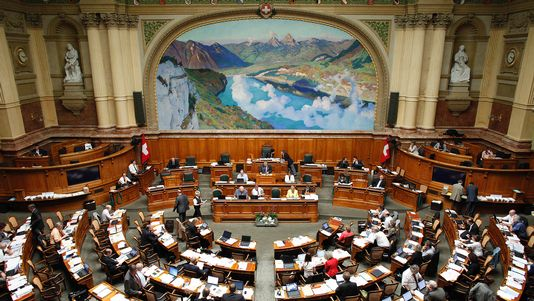 The Swiss parliament has agreed yesterday to cede yet more of our sovereignty to the US, in violation of its duties under Article 2 of the Constitution “The Swiss Confederation shall protect the liberty and rights of the people and safeguard the independence and security of the country.” Alongside the abstentions of some, the only party that adamantly opposed this was the Swiss People’s Party (the largest party) but that wasn’t enough. Parliament’s excuse is that if they don’t cooperate with the US, the Swiss banking and finance industries would be shunned. They are selling us minnows out along with their sacred principles of popular democracy and sovereignty. They are throwing away over seven-hundred years of democratic progress! They are choosing to enhance cooperation with a totalitarian country that ignores its own Sacred Constitution and holds people without trial and tortures them! The same totalitarian country where a federal judge agreed that Obama could sentence a US Citizen to death without any trial and have him assassinated wherever in the world he could be found (even though the victim might not be somebody we would have wanted to shake hands with the assasination was carried out in violation of every notion of due process)! They are kneeling before the same sorry excuse for a fake democracy that recently passed the National Defense Authorization Act allowing indefinite detention without trial, in violation of the 4th, 5th, 6th Amendments of the US Constitution, and Articles 29 through 30 of the Swiss Federal Constitution! All of this so that the IRS can prosecute its general warrants in violation of the 4th Amendment, compel people to self-incriminate themselves in violation of the 5th Amendment, collect “excessive fines” in violation of the 8th, and continue to double-tax US-persons abroad in violation of international legal principles of jurisdiction and despite having no legal mandate to do so (Congress has no authority over US Citizens abroad because they are not counted in the Census as Article 1 Section 2 of the US Constitution provides). Shame on every single deputy who voted for this! They are not Swiss! They are enemies of the Sacred Constitution, the Sovereign Swiss people, and our Beloved Helvetia! I think some of the minnows over here will turn piranha very soon. Personally, I feel my teeth getting very sharp. I would like to find out the name of every deputy who voted for this (I believe there was a roll-call vote) and keep each and every one of them on my permanent black list. They just committed an act of war against their own people; we must throw them all out into the street. They must never hold any public office or any position of responsibility in the private sector ever again. They must be held accountable for their traitorous actions. The only positive note is that the new treaty will allow dragnet fishing expeditions only in the case of particular banks where bank employees have « contributed to illegal models of behavior ». Otherwise, the US must state the name of the person. « Les autorités américaines enquêtant sur des comportements délictueux pourront obtenir des informations sur des contribuables non identifiés par leur nom ou adresse (demandes groupées) si la banque ou ses collaborateurs ont contribué à des modèles de comportement illégaux. Sinon, l’identification de la personne concernée restera nécessaire. » The other oddity is that the treaty is not yet in effect because the US Senate has not approved it yet. The UDC has already proposed a popular initiative on banking secrecy; this effort needs to be accelerated. The people must decide on this, we cannot let a bunch of turncoat politicians run the show. I would suspect that there is room for some judicial review of the new treaty, although I have not yet read the text, and I am thus uncertain as to what extent the treaty is “self-executing”. At any rate, as far as I am concerned the vote yesterday was invalid and the treaty null and void because parliament does not have the right to sign a treaty that goes so fundamentally against the directives of the Constitution. I hope our judges have some testicles. They are going to need them. God preseve Sacred Switzerland! God save us from tyranny! But the process doesn’t really happen this way. A lawyer who presented to a group on the topic of U.S. taxation of Canadian residents recently offered up the colorful phrase full ostrich to describe noncompliant persons whose strategy remains that of keeping on keeping on. So he can be reasonable sometimes and proactively suggest that policymakers ensure that the IRS be nicer to US-based “Minnows” but not to Minnows abroad?